Forget Alice, this is what a NEET life is really like. What a treat! Fuji Log, a low-budget anime that was aired back in the Spring of 2011 has finally been picked up by fan subbing group ARR. Fuji Log is a short comic anime about Osamu Fujiyama, a 33 year old NEET. He lives with his mother and his grandfather. 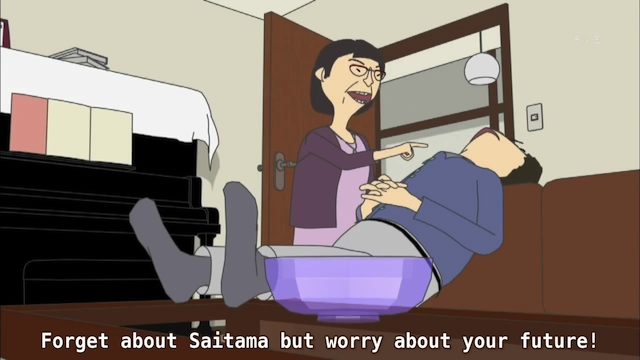 I watched the first few episodes raw back when the show came out, and found it pretty funny even when I didn’t understand it. The art work is rough (low poly count 3D, with very simple textures), but quite endearing. The voice acting is very good, for example Osamu is played by Takeshi Kusao (e.g. Saionji from Utena). Note: this is a very short anime, each episode is about 4 minutes. Please let my son get a job! 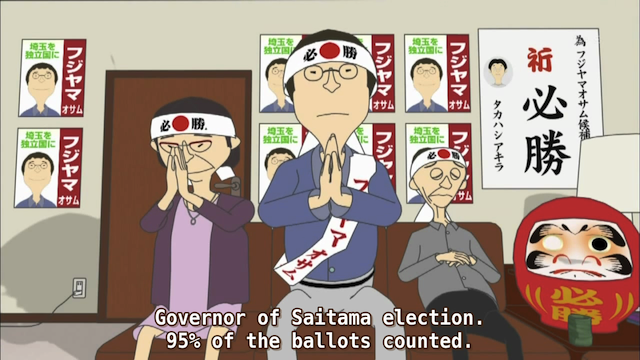 In the first episode, Osamu responds to his mother’s pleading that he get a job by seeking elected office as governor of Saitama. Driven by his love of his prefecture, and his belief that the other prefectures are looking down on them, he runs on a platform of succession from the rest of Japan. Things don’t go well. I have only seen one episode translated, but it was much more high-brow and even nuanced than what I saw of Nyanpire, Double-J, or Morita-san. I’m not sure if that is what you mean by “high-tier”, or not.